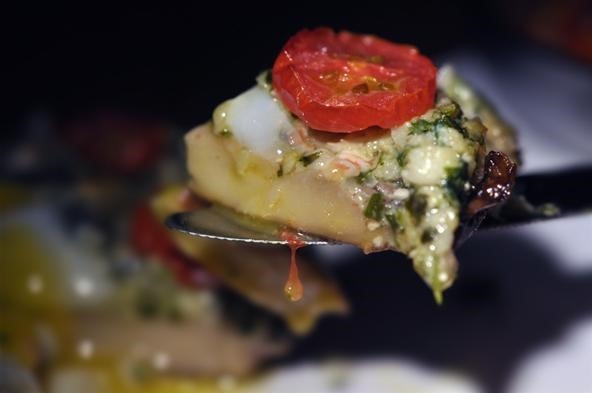 These are classic stuffed mushrooms with a luxurious twist! 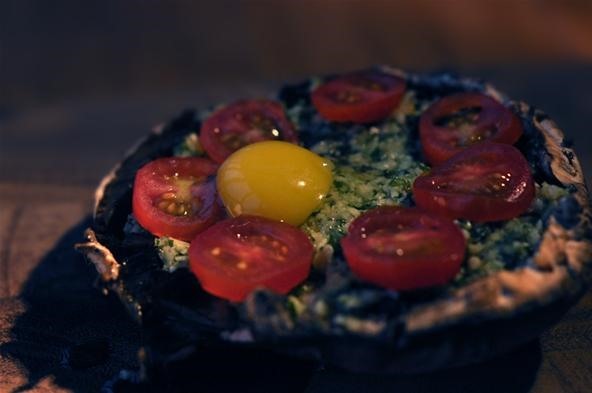 This time I'm using Portabello mushrooms with fresh pesto, tomatoes, and a quail egg on top. 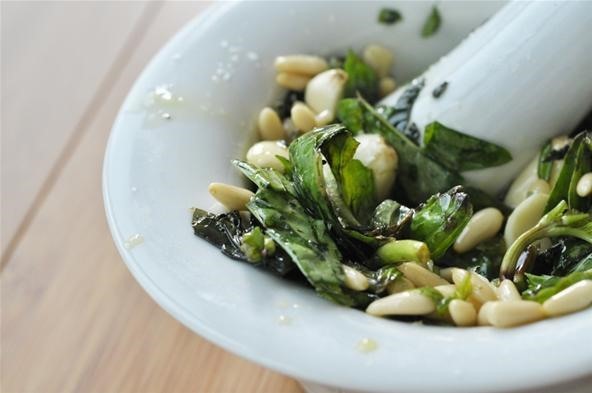 For the coarse grind pesto, you will need olive oil, basil, pine nuts, garlic, and parmesan cheese. 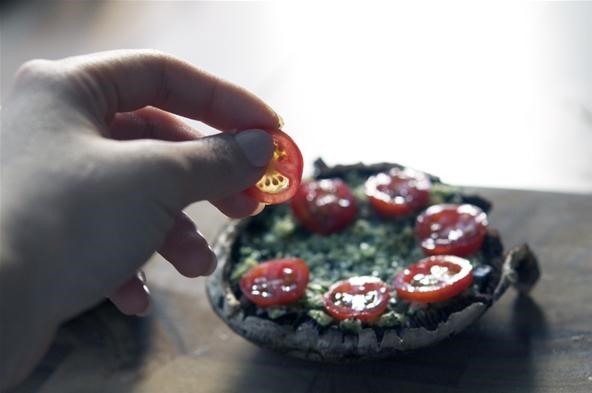 Use a food processor if you enjoy a finer texture, but a coarse grind will give this a little body and texture in contrast to the mushroom, which will end up being very soft after it is baked. 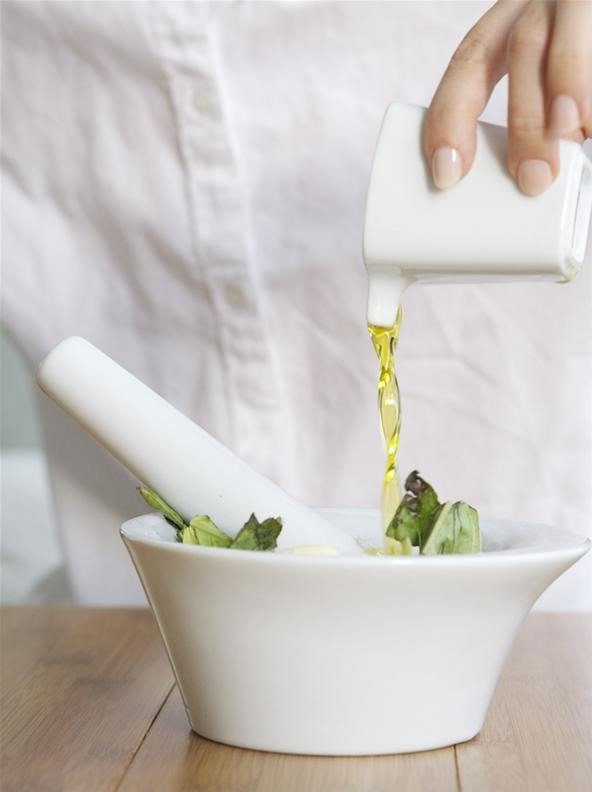 If you don't want to grind the pesto by hand with a mortar and pestle, feel free to put all the ingredients (except for the olive oil) into the food processor. Start the processor and slowly add in the olive oil as it is grinding to get a fine texture. You can also stop earlier to get a coarse texture through the machine as well. 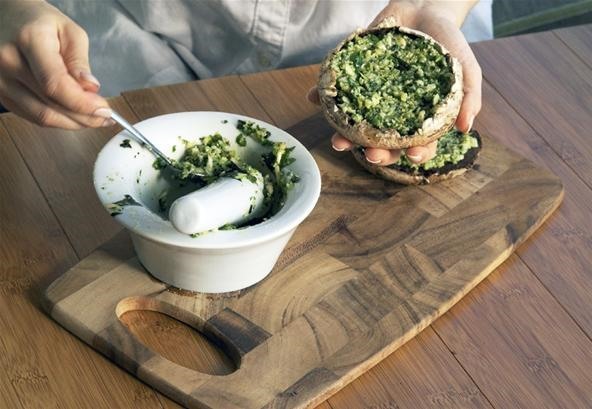 Next, lightly scoop mushrooms and fill with your pesto! 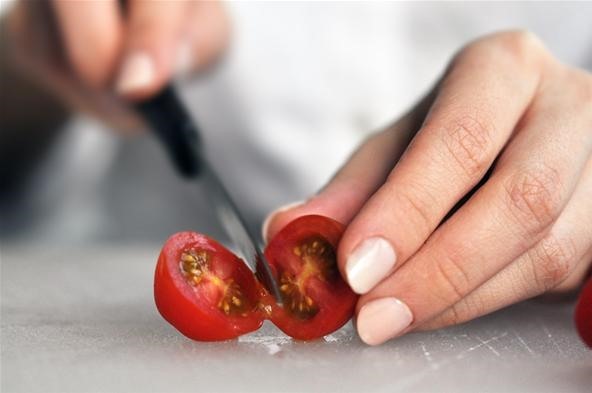 The, slice cherry tomatoes and place them in a circular shape on top of the pesto stuffed mushrooms. 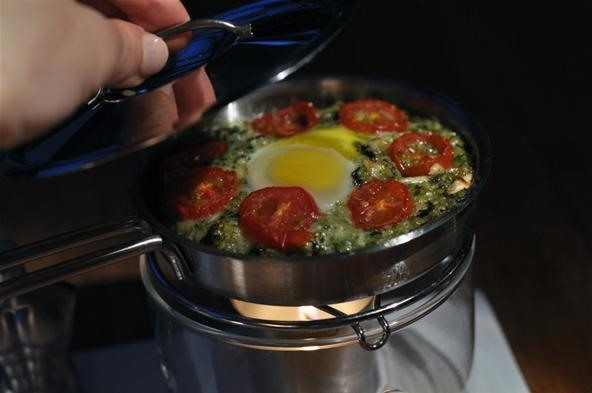 Crack a quail egg right at the center, inside all of the cherry tomatoes. 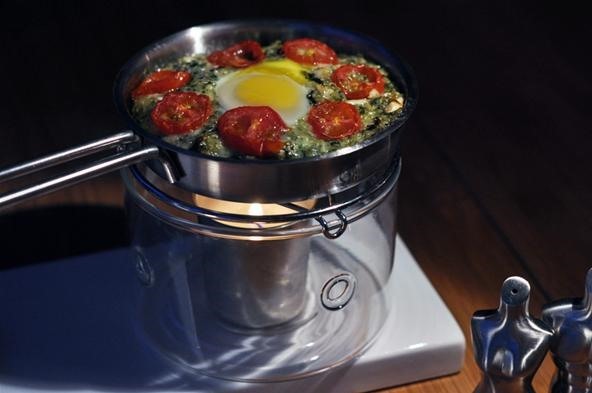 You can also use a regular egg if quail eggs are hard to find. Just use smaller eggs instead of jumbo sized. You can also use a bigger sized mushroom if you want to crack a jumbo egg inside for a full meal portion. Lastly, bake at 375 °F for 10-20 minutes and serve! You can serve this on a regular plate with a nice little side salad, but to go the extra step and impress your guests (if you are having a dinner party) serve them on top of a lit candle with a mini pan. This will keep the mushrooms warm! If you like some extra cheese, crumble some blue cheese on top before it gets baked. Wow. That looks so delicious! The way you photograph the process is truly a work of art.... Though I would think that cooking over a candle flame would take forever. Oops. Missed the final tip where you mentioned the candle was just to keep it warm, not for cooking. Very cool. This looks amazing, and it also looks like something I could do! Love the photos!